The Man With The Golden Gun was not the first time the franchise had seen such a weapon. James Bond had seen a golden gun before – in the right hand of Auric Goldfinger, who had the pretty dumb idea of shooting off his Colt .25 in a light aircraft. The gun was actually a Colt Official Police revolver that featured a gold plated finish and ivory grips. In the novel the Gold Plated revolver was a Colt Model 1908 Vest Pocket. Shooting off guns in planes is a bit of a movie cliche, but as this was one of, if not the first movie to feature the stunt, it certainly cannot be accused of cliches - well not this time, anyway. What happened next is however a little bit of an issue. Firstly, where the bullet hits is all important. If the bullet goes through the walls or skin of the plane, it will just create a small hole at most. There will be a small air leak. It could obviously cause a problem if it caught hold of some important wiring. Similarly, it cannot possibly be a good thing if the bullet hits a fuel tank. It could cause an explosion but is more likely to cause a leak. Either way, it's not good. The big issue here is that the great big blobby Auric Goldfinger is sucked out of a tiny window. There really is a very slim chance of that happening. The plane would de-pressurise, but this would happen over a few seconds. A lot of debris will be sucked out of the cabin, and if someone is sitting in the seat next to the window and is not strapped in, he or she could be pushed out by the de-pressurisation. However, Goldfinger was a fair way from the window, he was in a small plane that would not have been at the altitude of a commercial transatlantic airliner so the pressure would not have been that high, and as soon as he filled the hole, he would have blocked the de-pressurisation. As we're talking about planes and flying. This all occurred at the end of the film. At the beginning, we saw 007 arrive at the Fontainebleau Hotel in Miami. 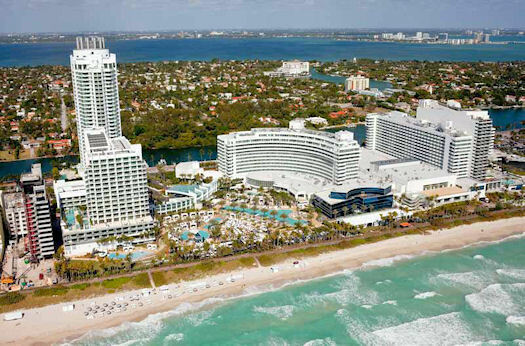 It is rated at 31 of 199 hotels in Miami at Tripadvisor and is available to book at reservation sites.